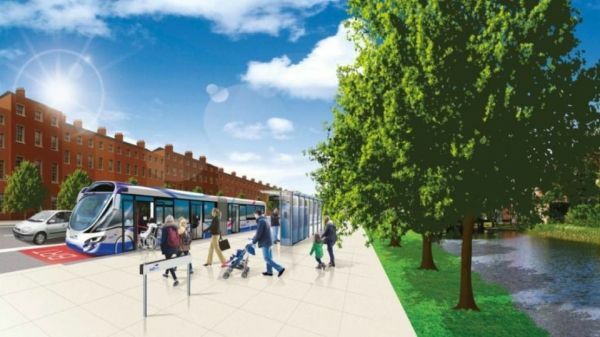 Three bus rapid transit routes, costing a total of about €650 million, have been proposed for Dublin by the National Transport Authority (NTA). The bus network would run from Swords in north Co. Dublin and the airport into the city centre; from the west Dublin suburb of Blanchardstown to University College Dublin (UCD) on the city's south side; and from the north Dublin suburb Clongriffin to Tallaght, south-west of the city. Dubbed Swiftway, the system would operate similarly to the Luas tram network and could cut bus journey times from suburbs into the city by up to 40 per cent, according to the NTA. Passengers would buy tickets from roadside vending machines, and the buses would have multiple doors at platform level allowing quick entry and exit. The authority says the airport service could carry up to 3,600 passengers in each direction an hour, with buses passing every two minutes. The NTA plans to apply for state approval for the airport line this year and believes it could get the go-ahead to proceed during the first half of 2015. The NTA says the airport line and the Blanchardstown-UCD line could be developed for between €150 million and €200 million each, while the Clongriffin-Tallaght route would cost €200-250 million. The authority says the cost of the airport line would be just a fraction of the €3 billion estimated for the shelved Metro North project. The metro scheme would have run above and below ground, connecting St Stephen's Green in the centre with Swords in north Dublin, via the airport. It was envisaged during Ireland's boom years but was officially "deferred" three years later in 2011, although it is now unlikely that it will ever be built.